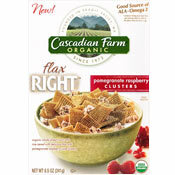 This cereal is comprised of Chex-style pieces (made of whole wheat, corn and rice) and "flax and pomegranate-raspberry juice clusters". The clusters are the best part of this cereal and there's a good amount of them. When eaten alone, the clusters are fantastic. They're loaded with flavor and you do get a sense of both raspberry and pomegranate. Unfortunately, that flavor becomes muted and overwhelmed when the clusters are eaten with the less exciting primary cereal pieces. The dull flavor of this cereal as a whole was especially disappointing because I really liked the texture of the cereal in milk. The main pieces soften as Chex-style pieces tend to do. Meanwhile, the clusters maintain a respectable little crunch which adds a spark of fun to an otherwise familiar texture. 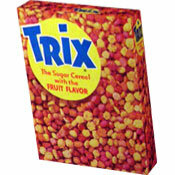 In the end, this isn't a bad cereal. It's just a simple cereal that plays it safe. I think of an old man looking at the box. For almost a century, he's eaten his shredded wheat and bran cereals... and bless his heart, that's what he likes. He's put off by the raspberries and pomegranate pieces on the box. "Too much dang flavor, " he warbles. To him I say, "It's okay. You can hardly taste them." Nutritional Considerations: Each 1 cup serving has 210 calories, 1.5 grams of total fat (0 grams saturated and 0 grams Trans), 45 grams total carbs, 4 grams dietary fiber, 8 grams sugars and 5 grams protein. What do you think of Flax Right Pomegranate Raspberry Clusters? Gonna be honest... a little part of my heart cools and hardens into stone every morning I wake up and I don't get to eat these. Long live the Raspberry Pomegranate!